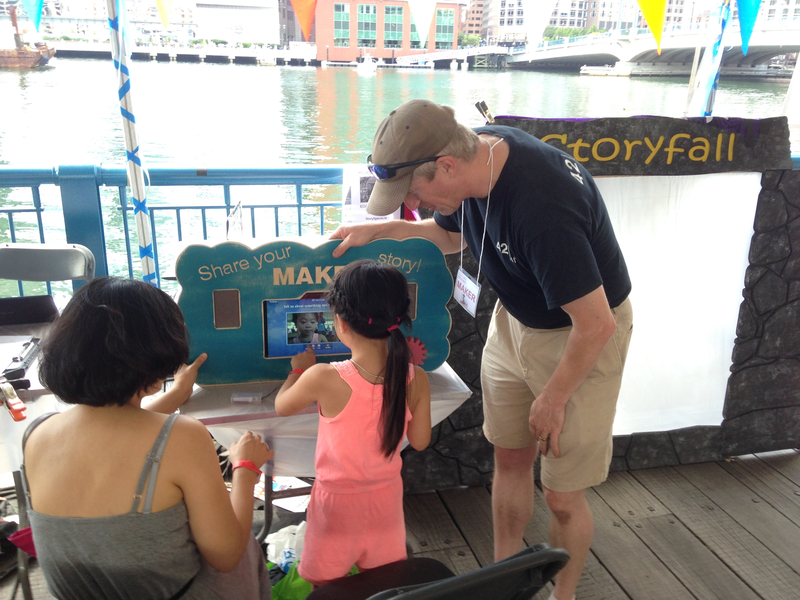 Great fun to participate in the very first Boston Mini-Maker Faire this last Saturday. 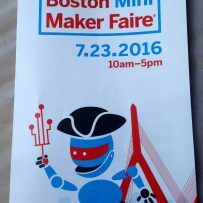 Our booth was set up right next to the Fort Point Channel, among three or four large tents of some 80 other makers. 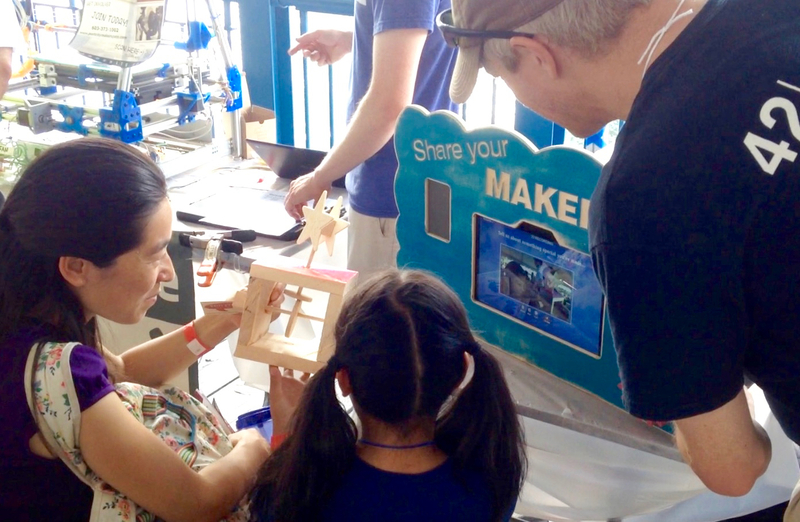 We made ourselves at home with makers of robots, boisterous hand made instruments, kid-created catapults, a tiny house, food trucks, and more. It was a great place to premiere our StoryFall. The idea: after visitors record their story (answering questions like: “Tell us about something special you’ve made” and “What is your favorite experience today?”), their image appears projected on a waterfall, spilling down over the edge. 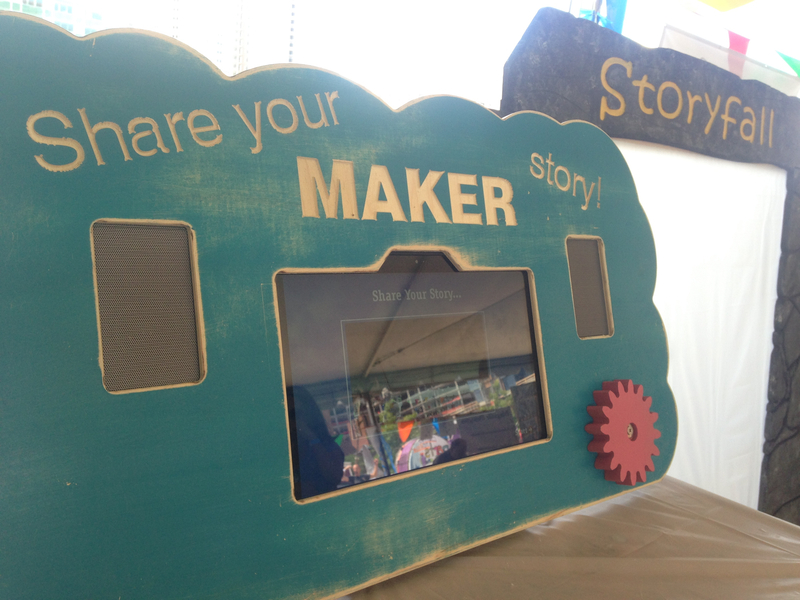 Text animates on, highlighting their participation with statements like “Inventing the future…at Boston Mini-Maker Faire.” The goal is to create a deeper, more emotionally engaging impact for the stories that are recorded. A pleasure to draw on the talents of Todd Harris at 42 Design Fab in the construction of the StoryFall. StoryFall is an idea I’ve been kicking around for years, combining real, 3D spaces with interactive projection, pulling stories more deeply into metaphor. Todd’s smart designs far exceeded my expectations, and looking forward to further development. Also trying out a new business name: StorySpaces.io (website coming soon). It speaks directly to the mission of using stories to build connections between people’s experiences in public places. You’ll be hearing more about this with an announcement soon about our new online recording feature — a game changer in my book. Keep an eye out.